Blood pressure is a measurement of the force exerted against the walls of your arteries as your heart pumps blood to your body. Hypertension is the term used to describe high blood pressure. 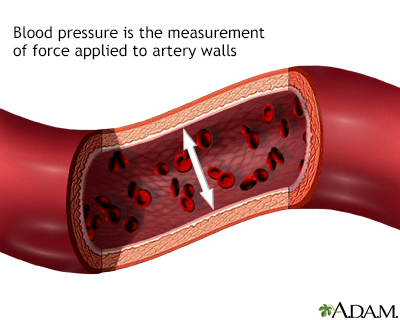 Untreated high blood pressure can lead to many medical problems. These include heart disease, stroke, kidney failure, eye problems, and other health issues. Blood pressure readings are given as two numbers. The top number is called systolic blood pressure. The bottom number is called diastolic blood pressure. For example, 120 over 80 (written as 120/80 mm Hg). Normal blood pressure is when your blood pressure is lower than 120/80 mm Hg most of the time. High blood pressure (hypertension) is when one or both of your blood pressure readings are higher than 130/80 mm Hg most of the time. If the top blood pressure number is between 120 and 130 mm Hg, and the bottom blood pressure number is less than 80 mm Hg, it is called elevated blood pressure. Most of the time, there are no symptoms. For most people, high blood pressure is found when they visit their health care provider or have it checked elsewhere. Because there are no symptoms, people can develop heart disease and kidney problems without knowing they have high blood pressure. Diagnosing high blood pressure early can help prevent heart disease, stroke, eye problems, and chronic kidney disease. 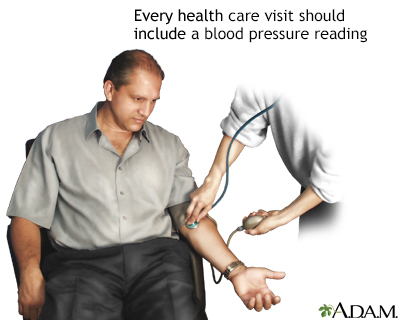 Your provider will measure your blood pressure many times before diagnosing you with high blood pressure. It is normal for your blood pressure to be different based on the time of day. All adults over the age of 18 should have their blood pressure checked every year. More frequent measurement may be needed for those with a history of high blood pressure readings or those with risk factors for high blood pressure. Blood pressure readings taken at home may be a better measure of your current blood pressure than those taken at your provider's office. Make sure you get a good quality, well-fitting home blood pressure monitor. It should have a properly-sized cuff and a digital readout. You should be relaxed and seated for several minutes prior to taking a reading. Bring your home monitor to your appointments so your provider can make sure it is working correctly. Your provider will do a physical exam to look for signs of heart disease, damage to the eyes, and other changes in your body. The goal of treatment is to reduce your blood pressure so that you have a lower risk of health problems caused by high blood pressure. You and your provider should set a blood pressure goal for you. If your blood pressure is between 120/80 and 130/80 mm Hg, you have elevated blood pressure. Your provider will recommend lifestyle changes to bring your blood pressure down to a normal range. Medicines are rarely used at this stage. If you have no other diseases or risk factors, your provider may recommend lifestyle changes and repeat the measurements after a few months. If your blood pressure remains above 130/80 but lower than 140/90 mm Hg, your provider may recommend medicines to treat high blood pressure. If you have other diseases or risk factors, your provider may be more likely to start medicines at the same time as lifestyle changes. If your blood pressure is higher than 140/90 mm Hg, you have Stage 2 high blood pressure. Your provider will most likely start you on medicines and recommend lifestyle changes. Before making a final diagnosis of either elevated blood pressure or high blood pressure, your provider should ask you to have your blood pressure measured at home, at your pharmacy, or somewhere else besides their office or a hospital. Eat a heart-healthy diet, including potassium and fiber. Get at least 40 minutes of moderate to vigorous aerobic exercise at least 3 to 4 days a week. Limit how much alcohol you drink to 1 drink a day for women, and 2 a day for men or less. Your provider can help you find programs for losing weight, stopping smoking, and exercising. You can also get a referral to a dietitian, who can help you plan a diet that is healthy for you. How low your blood pressure should be and at what level you need to start treatment is individualized, based on your age and any medical problems you have. If you have diabetes, heart problems, or a history of a stroke, medicines may be started at lower blood pressure reading. The most commonly used blood pressure targets for people with these medical problems are below 120 to 130/80 mm Hg. There are many different medicines to treat high blood pressure. Often, a single blood pressure drug may not be enough to control your blood pressure, and you may need to take two or more drugs. It is very important that you take the medicines prescribed to you. If you have side effects, your doctor can substitute a different medicine. If you have high blood pressure, you will have regular checkups with your provider. Even if you have not been diagnosed with high blood pressure, it is important to have your blood pressure checked during your regular check-up, especially if someone in your family has or had high blood pressure. Call your provider right away if home monitoring shows that your blood pressure is still high. Most people can prevent high blood pressure from occurring by following lifestyle changes designed to bring blood pressure down. Weber MA, Schiffrin EL, White WB, et al. Clinical practice guidelines for the management of hypertension in the community: a statement by the American Society of Hypertension and the International Society of Hypertension. J Clin Hypertens (Greenwich). 2014;16(1):14-26. PMID: 24341872 www.ncbi.nlm.nih.gov/pubmed/24341872. Xie X, Atkins E, Lv J, et al. Effects of intensive blood pressure lowering on cardiovascular and renal outcomes: updated systematic review and meta-analysis. Lancet. 2016;387(10017):435-443. PMID: 26559744 www.ncbi.nlm.nih.gov/pubmed/26559744.